A cube is a 3-dimensional diagram with all sides equal. If we divide it into the size (1⁄n)th part of its side, we get n3 smaller cubes. Shown below is a cube which is painted on all the sides and the cut into (1⁄4)th of its original side. Some observations: A cube has 6 faces, 12 edges and 8 corners. We can see that the cubes which got all the three sides painting lies at the corners. So the number of cubes which got painted all the three sides is equal to 8. Cubes with 2 sides painting lie on the edges (see the diagram). But the cubes which are on the left and right side of the edge matches with the corners. So we have to substract these two cubes from the number of cubes lying on the edge to get the number of cubes with 2 sides painting. Cubes with 1 side painting lies on the surfaces. Since, the top row, bottom row, left column, and right column matches with the edges, We must exclude these cubes while calculating the single side painted cubes. 1. A cube whose two adjacent faces are colored is cut into 64 identical small cubes. How many of these small cubes are not coloured at all? Assume the top face of the cube and its right side are colored green and orange respectively. Now If we remove the colored faces, we left with a cuboid, whose front face is indicated with dots. 2. A cube, painted yellow on all-faces is cut into 27 small cubes of equal size. How many small cubes got no painting? Assume we have taken out the front 9 cubes. Then the cube looks like the one below. Now the cube which is in the middle has not got any painting. The cubes on the Top row, bottom row, left column and right column all got painting on atleast one face. 3. All surfaces of a cube are colored. If a number of smaller cubes are taken out from it, each side 1/4 the size of the original cube's side, Find the number of cubes with only one side painted. 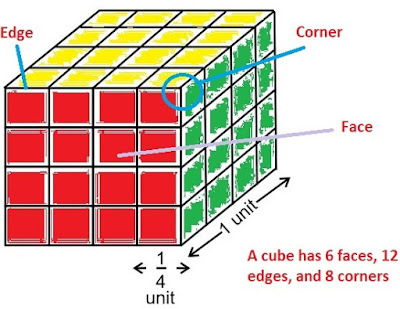 The original (colored) cube is divided into 64 smaller cubes as shown in the figure. The four central cubes on each face of the larger cube, have only one side painted. Since, there are six faces, therefore total number of such cubes = 4 x 6 = 24. (1) How many small cubes are there in the solid after the removal of the columns? (2) How many cubes do not have any coloured face? (3) How many cubes have only one red face each? (4) How many cubes have two coloured faces each? (5) How many cubes have more than 3 coloured faces each? The following figure shows the arrangement of 125 cubes to form a single cube followed by the removal of 4 columns of five cubes each. (1): Since out of 125 total number of cubes, we removed 4 columns of 5 cubes each, the remaining number of cubes = 125 - (4 x 5) = 125 - 20 = 105. (2): Cubes with no painting lie in the middle. So cubes which are blow the cubes named as s, t, u, p, q, r, m, n, o got no painting. Since there are 4 rown below the top layer, total cubes with no painting are (9 x 4) = 36. (3): There are 9 cubes namaed as m, n, o, p, q, r, s, t and u in layer 1, and 4 cubes (in columns b, e, h and k) in each of the layers 2, 3, 4 and 5 got one red face. Thus, there are 9 + (4 x 4) = 25 cuebs. (5): There is no cube in the block having more than three coloured faces. There are 8 cubes (in the columns a, c, d, f, g, i, j and l) in layer 1 which have 3 coloured faces. Thus, there are 8 such cubes. Thus, there are 8 such cubes. (1) How many cubes have three green faces each? (2) How many cubes have one face red and an adjacent face green? (3) How many cubes have at least one face coloured? (4) How many cubes have at least two green faces each? Clearly, upon colouring the cube as stated and then cutting it into 125 smaller cubes of equal size we get a stack of cubes as shown in the following figure. The figure can be analysed by assuming the stack to be composed of 5 horizontal layers. (1): All the corner cubes are painted green. So there are 8 cubes with 3 sides painted green. (2): There is no cube having one face red and an adjacent face green as all the green painted cubes got paint on atleast 2 faces. Therefore, there are 125 - 27 = 98 cubes having at least one face coloured. (4): From the total cubes, Let us substract the cubes with red painting, cubes with no painting.